Do have trouble getting your boy to wear a raincoat? Rainy days can be a fun time to dress up like a superhero, or maybe he'd prefer to be a fireman, a dinosaur, or a frog. Make rainy days extra fun by wearing one of these cool raincoats. And don't forget those all-important rubber boots! How else do you expect a self respecting kid to get past a mud puddle? You didn't expect him to avoid it, did you? 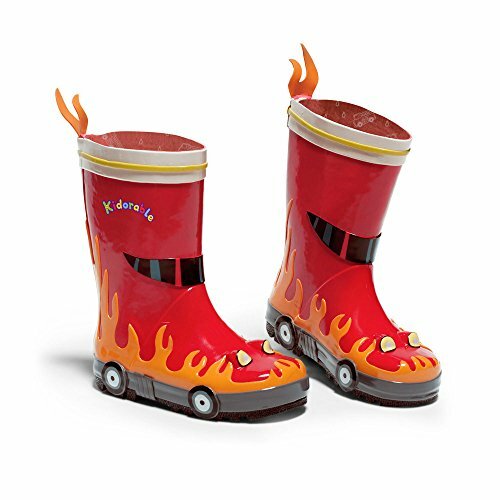 Scroll down the page to see some options for a cool raincoat and rubber boots a boy will love! Rainy days can make you blue or, remembering Gene Kelley in "Singing in the Rain," they can get you splashing in puddles and dancing up a storm. Or if you're a little boy with the right raincoat and rubber boots, you can be anything you want to be. Like dinosaurs? There's a raincoat you can wear to become one of the giant lizards. Wish you could be Batman? No problem if you have a Batman cape raincoat to swish around in. How about Superman? Is he your favorite? 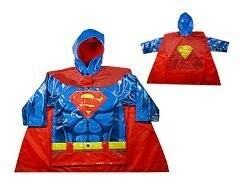 There's a Superman rain cape, too. And the firefighter raincoat on this page looks really authentic. 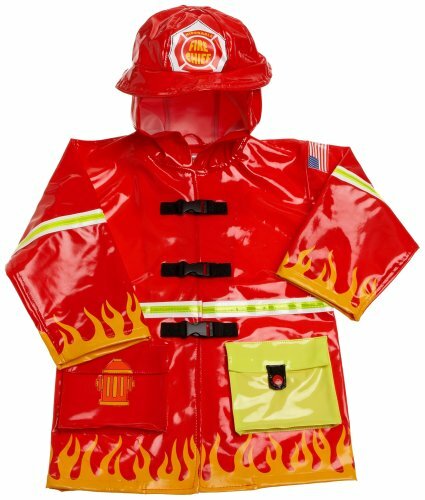 You'll be ready to put out any possible fires wearing this firefighter rain coat! 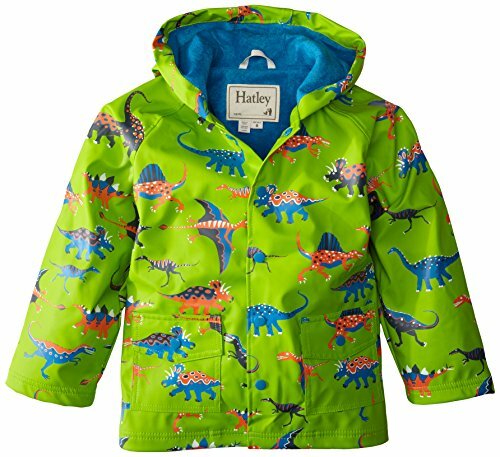 Dinosaurs make for a pretty scary raincoat, don't you think? 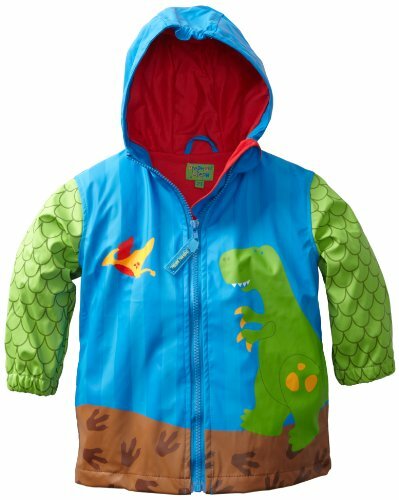 If your little boy likes dinosaurs, one of these coats will be fun to wear. Listen to him growl while wearing one of these coats. Batman is a favorite superhero again. 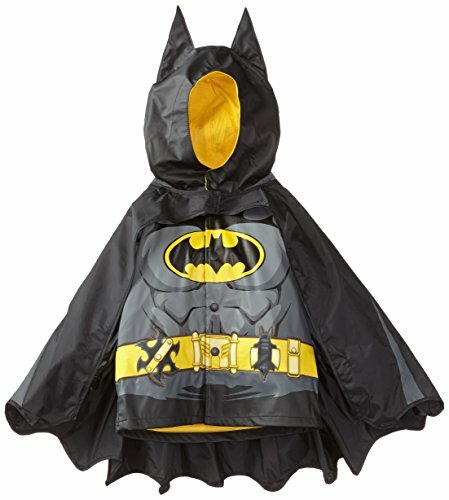 Your mini-hero will feel extra powerful wearing this caped Batman raincoat. You can use this caped coat as a costume and then keep it for rainy days. Dress-up fun can have practical uses! 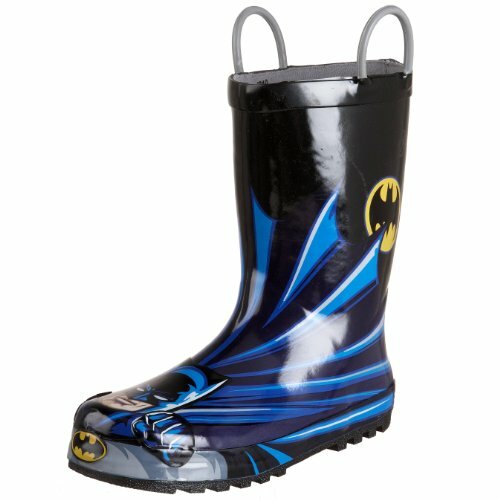 Now the rain coat will keep the top half of your son dry, but what about his feet? It's almost impossible to send a little boy outside on a rainy day and expect him to avoid rain puddles. Come to think of it, I have trouble avoiding rain puddles, too. There's just something so irresistible about splashing in a puddle on a rainy day. Be honest, now -- can you walk by a puddle without testing it a bit with your toe if not landing in it with a full blown kaploosh? And I'll bet your son has watched you do it. Why not protect his feet with a pair of rain boots, otherwise known as gum boots or rubber boots? 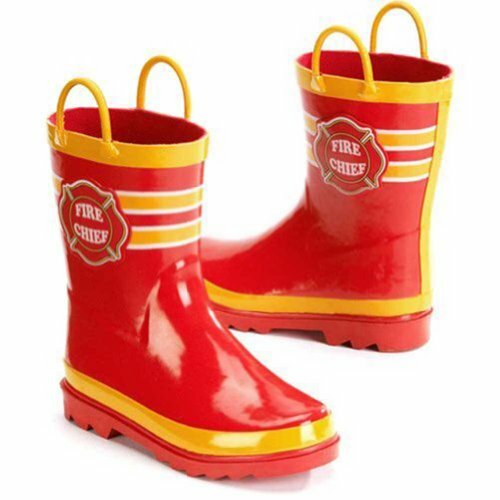 These rain boots match the rain coats, though there are a few boots thrown in that have different designs, too. The variety available amazes me. I don't remember there being that many styles when my kids were small. I know we would have had a hard time picking which one we would buy if we could only choose one. I suppose as your child grows you may get to choose several. Which Theme Does Your Child Like Best? Did You Find a Raincoat and Boots for Your Little Boy? These Character Raincoats Are So Cool! I hope you've found the perfect raincoat and rubber boots for the boy in your life. These raincoat on this page can do double duty as dress up clothes and could even be worn on Halloween! Please leave a message below to let me know whether any of these raincoats will work for you or if you have suggestions for other types of raincoats you'd like to see. Keep well and keep dry! Did You Find a Coat for Your Little Boy? Thanks, Mladen. It's fun to think back at how such little things can mean so much when we are kids. CountryMouseStudio and Kinworm, thanks for your comments. I can imagine little ones really enjoying the superman and batman capes. Yes, I had three of them at my house. Rubber boots were very important items. Oh my what awesome raincoats and rain boots for boys. Kids love playing in the rain, its a great distressing experience for energetic boys.